Order your copy of REBEL WOLF today! 5.0 out of 5 starsBack in beautiful Maui. Anna Lowe has given us another wonderful story with a beautiful HEA. This is the 4th in the Aloha shifters Pearls of Desire series. The story of Chase and shy Sophie. The two of them have been drawn to each other since Chase and his team arrived in Maui. Chase is a wolf shifter who grew up with his wolf mother's pack. He doesn't fit in well in the human world and has considered returning to the wild but the first glimpse of Sophie giving out smoothies from her special truck changes his mind. Now all he has to do is pluck up the courage to ask her out. Sophie is a shy woman with a beautiful soul. She came to Maui to escape and her elderly aunt gave her refuge. Then her aunt passed away and Sophie found out that she was the executor of her estate. She didn't know what the estate was worth but meant to meet with the lawyers soon. Meantime there are other players in the game and Sophie finds that her life is threatened. Chase was part of a special ops team and is not going to sit back and see Sophie in danger. Action and romance abound in this story as the power of the next Pearl of Desire comes into play. 5.0 out of 5 starsA great story that brings another cleverly hidden pearl to light, in the beautiful island of Maui. A great story that brings another cleverly hidden pearl to light, in the beautiful island of Maui. Do yourself a favour and read this series of wonderful characters. Ms Lowe has a way of making her characters real and you really do get invested in them. You could read this as a standalone but you will want to read the other books after you do. We also have an interesting storyline in regards to Sophie's background and what she was trying to leave behind. Sophie and Chase have been making goo goo eyes at each other for quite a few months now over the counter of the smoothie truck Sophie works at. Our very sweet natured and wonderful Chase has finally made a move to be with his mate Sophie. They are going on a date but before they can, things get blown all to hell and back. These two sweet main characters must be two of the nicest and most innocent people ever. No matter their backgrounds, there is a purity to Chase and Sophie that endears them to you. Moira and her plans are once again causing problems but our guys are able to defeat this latest problem. Loved how Chases’ home pack was protected and are now safe and secure. 5.0 out of 5 starsA fantastic story. 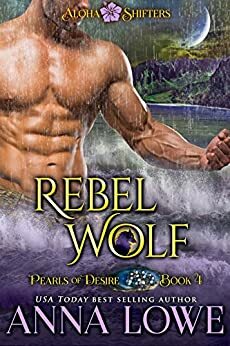 Another fantastic addition to the Aloha Shifters Pearls of Desire series I love them all. I’m not going to give any spoilers because this book speaks for itself and if you see Anna’s name on a book you’ll know that your getting a fantastic shifter story. But if you want to know more then read Anna’s blurb and that will give you the gist to this story there’s action, suspense, danger, love, passion and so much more to keep you entertained and turning the pages I loved all of it. A fantastic story a 5 plus ⭐️ read and I highly recommend this book it’s definitely well worth the read. I have read nearly everyone of your books and can't believe how believable they are!! They take me into another world, a world that I just love to explore, can lose myself in and not worry about this one. You keep me wanting more! You have done it again, what a great addition to the already brilliant series. December is a long way away to wait for the next book. I just loved the characters and the dogs were a beautiful touch. Bring on the next one.